Flan My all time favorite dessert ever! In a sauce pan over low to medium heat place sugar and a teaspoon of vanilla until it melts and turns a golden light brown. Pour HOT melted sugar into a warm 9” round glass baking dish. (warm up the dish first, it will make it easier to coat the bottom completely with the sugar). In a separate bowl, mix the eggs, evaporated milk, sweetened condensed milk and a teaspoon of vanilla. Mix until smooth, pour into the baking dish. Place 9 inch baking dish on a cookie sheet and pour in about a 1/2 inch of water into the sheet. Bake for 55 minutes. Let cool to room temperature and place in the refrigerator. 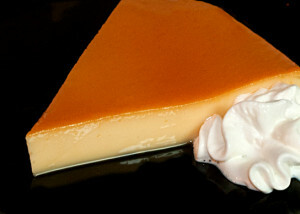 Once chilled, run a dull knife around the edges just to make sure the flan doesn’t stick and flip onto a plate by placing a plate over the baking dish and invert to remove the Flan and serve.